You have probably seen a fair few photos of this stunning couple circulating on social media & here on the blog, but what you might not know is that the bride, Georgia, is a blogger herself. Georgia’s website is loved by many, as is her instagram page, and she wrote a totally fab blog post about her wedding day here at Ever After… we couldn’t not share it with you! So below are Georgia’s own words about her special day, and here is a link to the blog on her website. We had a gorgeous day in Devon, just us and our best friends and it was completely perfect. When we decided to get married, we knew it wouldn’t be traditional. I’m definitely not one of those girls who has always dreamed of getting married and I’m just far too laid back to plan a big wedding. We decided to have our actual wedding day with our two favourite people, and then celebrate with family and friends later on. Our wedding party will be in a converted barn near to where we live on our one month anniversary. John can’t wait to wear his suit again but naturally I’m keen to spend even more money and potentially buy another dress (if you’ve seen anything sparkly and gorgeous, link me!). The thought of anything traditional fills me with dread. When we were considering the prospect of marriage (no romantic proposal story over here gals!) 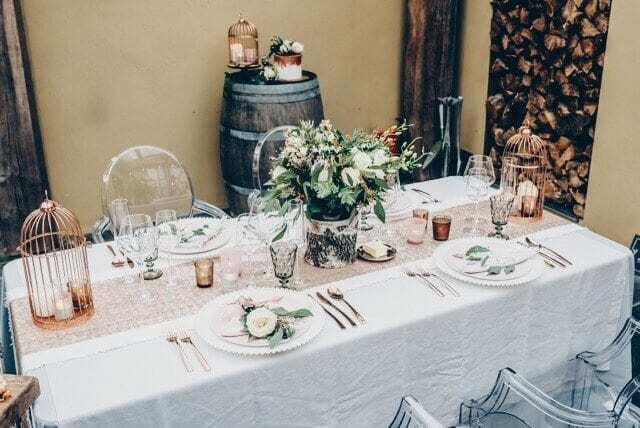 we literally said ‘right, what would our perfect day look like?’ and quite quickly we were clear that it would be intimate, relaxed, in a gorgeous setting with great food and great wine. There would be no big white dress, no first dance and I am definitely nobody’s property to give away! We took away all of the bits that neither of us like and thought that it might actually be quite fun. John actually found our venue whilst googling away – I’m fairly certain we’ve been on every single website of venues offering exclusive use for intimate weddings or elopements. Our venue (Ever After) stood out straightaway, one of the massive bonuses for us was that they sort out the flowers, photographer, food and cake for you. I checked out the florist and photographer they use and loved their style. I was never going to be the girl DIY’ing her whole wedding so for the elopement package to include some of the bits that were so important to us, plus the use of the most beautiful honeymoon cottage, Ever After looked perfect. We got in touch with Nicola the owner and pretty quickly set the date – we confirmed the booking on 16th November 2016 for 16th November 2017! I love love love when businesses have good websites, we booked purely based on getting an insight into the venue from their site. Devon is around a 5 hour drive from where we live and it just wasn’t practical to visit at that point so we took a bit of a risk but it was so worth it. Fun fact: we were going to just go ahead the two of us and not tell anyone beforehand. We pretty quickly realised that we both actually really like our families and didn’t want them to hate us so we booked our party venue and set a date for that. We asked our best friends to be witnesses and we were good to go! I know that budget is a huge thing when it comes to a wedding (average wedding cost is now £27k, say whaaaaat!) and I think we probably committed a cardinal sin by not setting a budget upfront. My view on life is that if you’re going to do something then you should do it properly and I wholeheartedly applied that principle to our wedding! We did an initial ‘best guess’ at costs and can safely say we pretty much trebled that. We were both pretty chilled about it and John, as usual, was the sensible one and on occasion made me reign it in slightly (apparently I don’t need actual Sean Paul to perform at my wedding party). We still hadn’t told anyone except Chloe and Tom we were getting married so we (I) figured we might as well do so with a pretty great engagement ring. We made an appointment with Aimee from Clarity Diamonds to chat through what we wanted and look at some loose diamonds. Her work is all bespoke which I loved and the outcome is even better than I could have ever imagined. I’ve got a 1.5 carat engagement ring with a vintage rose cut diamond in the centre, set in rose gold. Both wedding rings are rose gold too…thank God John was on board with that idea! The rings took 4 weeks to make and it was, without a doubt, the longest 4 weeks of my entire life. Once they had arrived we told our families and friends the news which was so lovely! I’m still all about that rose gold life so I knew in terms of colours, I wanted rose gold, lots of greenery and potentially blush pink and burgundy. I bought a blush pink dress and had a vision of John in a navy suit. We went to Reiss to try on a few and the one he loved was grey. Thank the lord I was fairly relaxed throughout the whole process; I didn’t love the blush pink and grey combo so I then bought the dress I ended up wearing approximately 1 week before our wedding. It was burgundy and looked great with John’s suit and burgundy tie and pocket square. FYI John’s outfit cost approximately ten times what mine did. Good old ASOS! I knew I didn’t want to spend a fortune on a dress – there were other parts of the wedding that were the priority for me. FYI Reiss was a great place to shop for a suit – 11am on a Sunday and I was knee deep in prosecco whilst John spent an hour or two working his way through their options. They also tailored the suit perfectly which took away the hassle of having to find somewhere else to get that done and he managed to get shoes, socks, full suit and pocket square from there. He had already bought his knitted tie from Jigsaw for 50 british pounds. Fifty. He loved it though so it was well worth it. We told Chloe and Tom to wear whatever they fancied, it was sheer luck that it all looked fairly coordinated! Neither of us like to deal with detail so Ever After were great in terms of venue dressing; I sent a link to my Pinterest board and the outcome was honestly perfect. Completely perfect. And we didn’t have to do a thing! 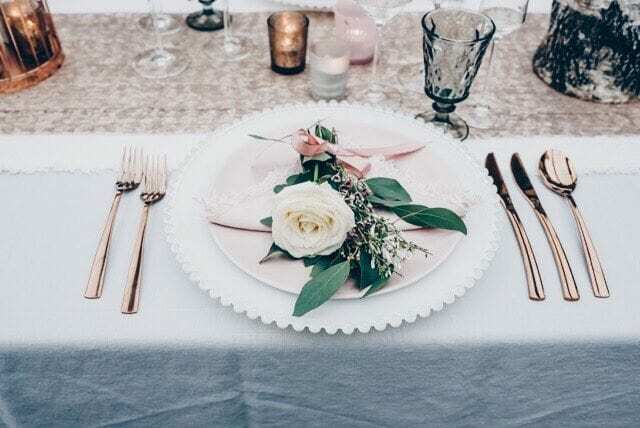 They even had rose gold cutlery for us – the dream! The same goes for Amanda our florist – we talked colours and I just asked her to do her thing. She’s the expert and I was 100% happy to trust her. My absolute favourite part of my outfit was my flower crown made by Amanda, it was perfect and really complimented that whole floral boho vibe that I love. John and I are both massive foodies so that was always going to be really important to us. Our starter was arancini and our main course was pork belly with some incredible cracking, croquette, squash, cavalo nero and an apple & cider reduction. We were originally going to have carrot cake as our wedding cake but we ended up going for a carrot cake dessert with orange gel and walnut brittle. It really went down a treat and I’m so glad we chose it. Our cake was red velvet flavour and again, we were pretty relaxed in terms of what we wanted. 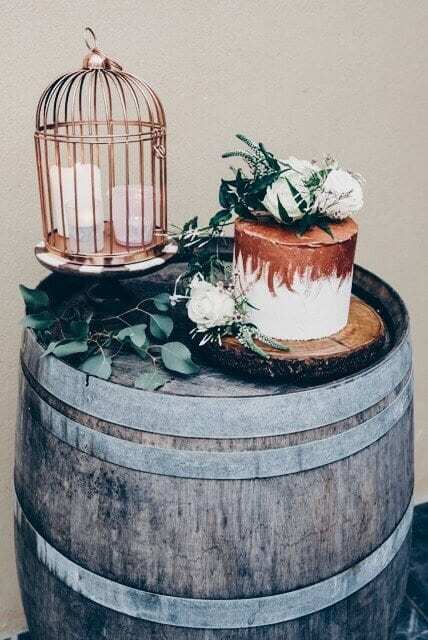 It was lovely doing it this way actually because there were lots of little surprises – we had no idea what the cake would look like and the end result was quite literally my dream cake! It also tasted dreamy; who knew I’d be able to eat 8 slices in the space of two days! We’ve got a big chunk in the freezer ready to defrost next year for our one year anniversary. On the actual day, the four of us had breakfast together. It was lovely to wake up together on the morning of our wedding day so I’m happy we ignored that tradition too! Chloe and I got ready together whilst the boys did their own thing. I did my own hair and makeup and I’m so happy I did. I had a makeup trial a few months ago and whilst I really liked the result, it wasn’t anything I couldn’t do myself so I made that decision fairly early on. I was going to have a hairdresser but in the end I got bonded hair extensions (which I love!) and I bought a very snazzy GHD hair curler which meant Chloe and I could do it ourselves. Our day was really relaxed and after a slight panic at 12:20 when neither Chloe or I were dressed and neither of us had our hair done, it all came together and John and I got married at 1pm, had some photos taken, had dinner and chilled in front of the fire eating cake and just having a lovely time. We all got back into our pjs in the evening and spent the night playing games. It was so much fun. I’m currently sitting in bed in our minimoon hotel having had the loveliest week. We got our professional wedding photos through this week (within a week of the wedding…impressive!) and we adore them. They capture us so perfectly and I couldn’t recommend Clare Kinchin more. Devon was perfect and this Lake District minimoon has been the loveliest week. Rainy but that suits us given all we like to do is eat and chill! We’ve got three weeks until our wedding party and we’re getting excited. it’s all starting to come together I think…dessert table, doughnut wall and all! My best advice for anyone wedding planning is 100% to do whatever it is that you want to do. It isn’t anyone else’s wedding so what your family or friends think shouldn’t influence your plans. If there’s something you want to do that isn’t usually done at weddings, go for it! If there’s something traditional that you really don’t want to be part of your day, just don’t do it! The most important thing is that you have the most wonderful time and that your day reflects you. What a fabulous blog! The cake was by Harrie (Boo to a Goose). Here is a link to Georgia’s instagram page, and another link to Georgia’s website. Previous PostHow many wedding venues should you visit? Next PostHow do you compare wedding venue prices...?